I’m hoping to do something a little more interesting here, but currently I’m on vacation! So much so, that I haven’t even been bringing my camera places. Hope you all have a safe and happy night and we’ll see you in a week or so! Went to bed last night with a plate of gifted cookies on the counter and woke up this morning to birds outside the window. I think somewhere there’s poetry in being able to come back to a house that feels like home, have a four year old just want to cuddle in your lap and have the neighbourhood barista be so happy to see us. 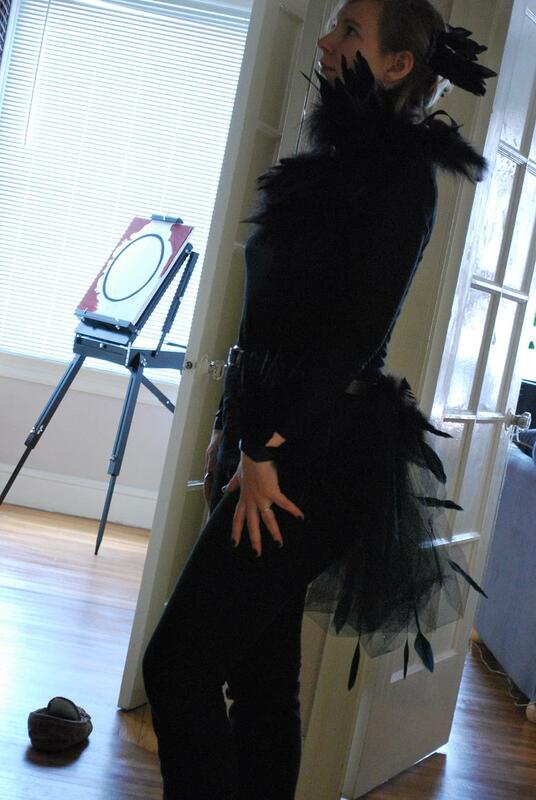 I tried to replicate this Raven Costume this year. I was willing to put the time into making it since I would be using it while volunteering at the hospital as well as going to a few parties. I loved the feathers and the bustle. And, it seemed easier than making a shark costume. The breast feathers were a bit fluffier than in Martha’s picture, but I’m generally happy with it. I used some hair combs for the hair feathers since my hair is too short for putting up and just having feathers stuck into. Here’s the whole thing. The bustle/tail is my favourite part. Instead of pinning it to my clothes, I created a loop out of the felt, and slid a belt through it. This made it really easy to take on and off again – which is key because sitting down with a tail isn’t as easy as animals make it look. This must be why we lost ours somewhere along the evolution line. 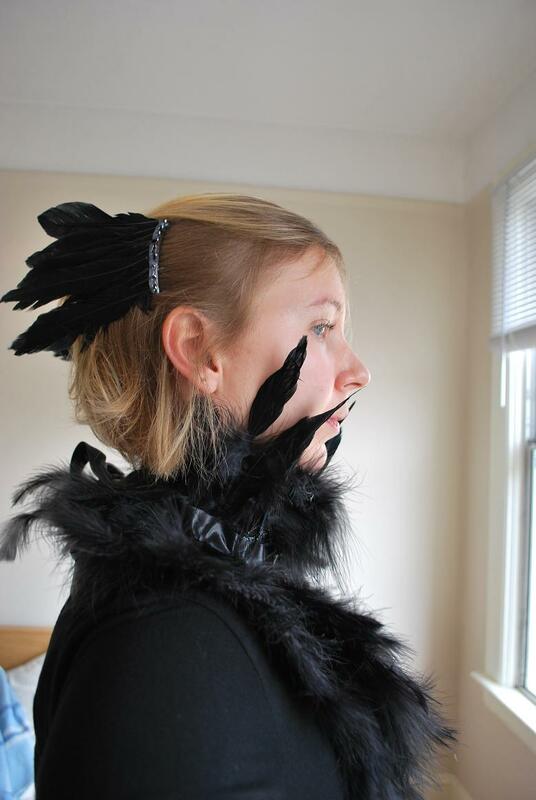 I had a beak too, but it kept trying to poke my eye out, so I ended up taping it to a chopstick – opera glass style. This method worked perfectly as I didn’t have to wear something on my face all night (which I hate), and I still got to have a beak. No good photos of it, though. Prince Charming went as The Dude from the Big Labowski. He wore the sweater I knit him (which is only currently good as a costume, rather than an actual sweater – I keep meaning to fix it, but so far haven’t had time), and carried an empty milk jug. A pretty lazy costume, which is idea, for someone dressing up as The Dude, since he’s a lazy guy to begin with. Hope you all had a fun Hallowe’en! 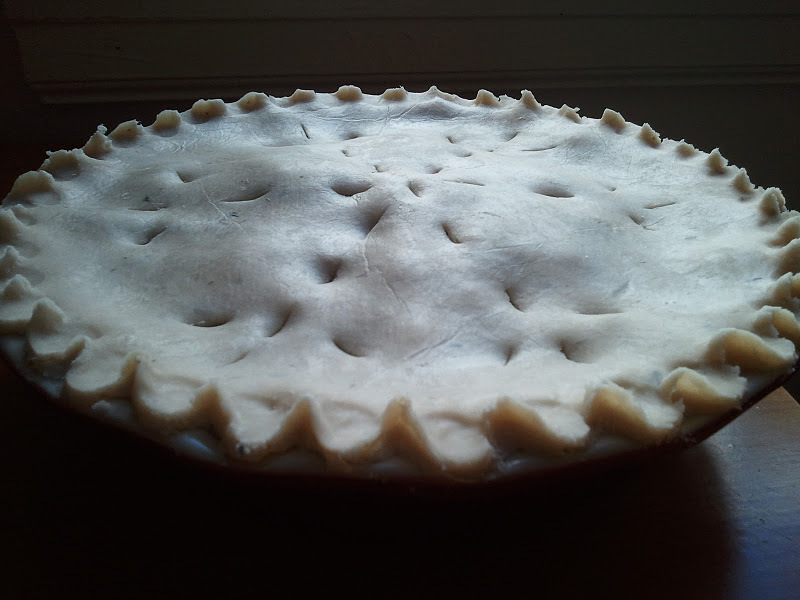 Next holiday: American Thanksgiving – What should I make? I’ve been super busy with studying, volunteering, costume making, and baking lately. Coming soon…. my pumpkin carving and costume making! I made those brownies last night with another fairy tale princess and they were the best brownies ever. Seriously. Go make them. For now, I’m off to the hospital to do some reverse trick-or-treating for some sick kiddos. I’d take a picture of my fabulous raven costume, but I can’t seem to get it all in the shot by myself. I need my Prince Charming to help me with that…. so… COMING SOON!